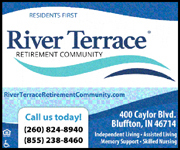 Joline A. Goebel, 92, of Marion, IN, and formerly of Huntington, IN, died Tuesday, Feb. 12, 2019, at 12:40 a.m., at York Place in Marion. Mrs. Goebel had lived all of her life in Huntington up until 2016. She was a homemaker throughout her life. She was born Dec. 5, 1926, in Huntington to Charles W. and Blanche Shoemaker. She married John A. Goebel on May 21, 1948, and he preceded her in death on Sept. 14, 2015. She is survived by a daughter, Pamela (Terry) McNutt, of Gas City; four grandchildren, Katie (Jordan) Masters, Nate (Stevi) McNutt, Abi (Brian) Rennert and John Christopher Goebel; and four great-grandchildren. She was preceded in death by a son, John “Randy” Goebel. There will be no visitation or funeral service. 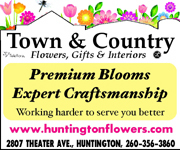 Burial will take place at a later date in Huntington. 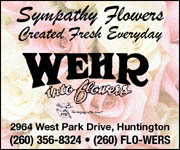 Needham-Storey-Wampner Funeral Service, Storey Chapel, 400 E. Main St., Gas City, is in charge of arrangements. 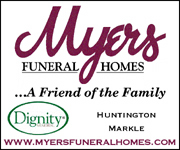 Memorials are to Huntington County Humane Society or to the humane society of the donor’s choice.